FARGO, N.D. (CNS) — Mark G. Thiel holds the key to quite a bit of knowledge on Native American Catholics. The archivist has been examining and preserving the records of the Tekakwitha Conference, the Bureau of Catholic Indian Missions and other Catholic native groups for more than a quarter century at Marquette University in Milwaukee. At its 75th anniversary gathering July 23-27 in Fargo, Thiel gave the Tekakwitha Conference an overview of its history, calling the organization a “transformative force” in American Indian Catholic communities. 1884: U.S. bishops sign a petition asking Pope Leo XIII to initiate the canonization cause for Catherine (Kateri) Tekakwitha, a North American Indian maiden known for her deep spirituality and love of Jesus. — 1885: Letters supporting her cause are signed by 906 native people. — 1939: First conference is held at the calling of Fargo Bishop (later Cardinal) Aloisius Muench. Twenty-nine men, a mix of diocesan and religious clergy, and three native laymen attend. — 1940: Conference meets in Jamestown, North Dakota; chooses the name Tekakwitha. — 1943: Pope Pius XII declares Kateri venerable. In its early years, the conference is composed of missionaries, and deals mostly with “reservation-related challenges.” But beginning in 1948, concerns expand to off-reservation resettlement, help for families adjusting to city life and government cooperation. — 1956: For the first time the conference meeting features Native American speakers: U.S. Congressman Ben Reifel of South Dakota, a Rosebud Lakota, and Bureau of Indian Affairs Commissioner Robert L. Bennett of the Wisconsin Oneida. — 1957: Conference is hosted by the Jesuit-run Mother Butler Center in Rapid City, South Dakota, the first urban Indian Catholic center in the U.S.
— 1963: As the Second Vatican Council is underway, the conference looks at its membership and concludes that it should remain a male organization open to Indian missionaries, the religious superiors of missionaries and diocesan priests with native parishioners. The organization acknowledges the important contributions of women religious in Indian missionary work, but excludes them from membership with the suggestion that they form their own organization. — 1964: Conference marks 25 years with a meeting of 39 members from 14 states. Jesuit Father John Brown of the Blackfoot Nation is the first Native American priest to attend. — 1971: Discussions are held on “how missionaries can best support Indian self-determination” and on the new permanent diaconate for Native American men. Three women religious attend. — 1977: Rapid City hosts the conference and for the first time. A number of native clergy members, women religious and laypeople are sent invites. With 46 attendees, it opens with a lament about the organization’s ineffectiveness and stagnation. The board is voted out and a task force is appointed to oversee reorganization efforts. — 1978: The task force sends conference invitations to native Catholics across the U.S., and a record 220 people attend. A School Sister of St. Francis, Sister Jose Hobday of the Seneca Nation, becomes the first woman religious to be a keynote speaker at the conference. — 1979: In Yankton, South Dakota, the meeting draws 200 people, including 66 native Catholics. An Ojibwe laywoman, Bea Swanson, stands to ask if the laypeople might be able to talk directly to the bishops present. With missionaries and priests out of the room, the “circle of 66” meets with three bishops and voices concerns about the conference and other Native American church matters. “Thereafter, native Catholics possessed new confidence and the tenor of the conference changed forever,” Thiel said. — 1980: Pope John Paul II beatifies Kateri. In Denver, 600 people attend the conference meeting. For the first time, native people comprise the majority. The conference establishes a permanent office in Montana and it encourages the formation of local Kateri circles. — 1985: Syracuse, New York, hosts the annual meeting and a conference pilgrimage is made to Blessed Kateri’s birthplace near Fonda. 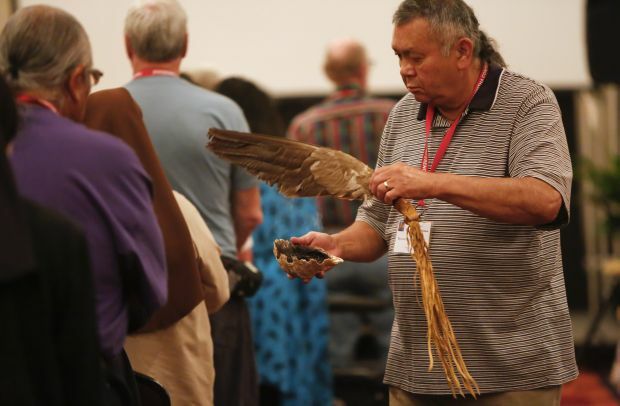 In the mid-1980s conference features expand to include liturgies with native languages and customs, sunrise services, healing services, processions and shrines devoted to Blessed Kateri, youth programs and the presence of native regalia. The conference also begins providing leadership training and workshops on inculturating native traditions within a Catholic context. — 1989: Conference returns to Fargo to mark its 50th anniversary. — 2006: Sister Kateri Mitchell, while in Seattle for a conference planning meeting, is called to the hospital bed of Jake Finkbonner, a 5-year-old Lummi Nation boy being treated for an aggressive life-threatening infection on his face. With his parents and a relic of Blessed Kateri present, they pray over Jake. Moments later, nurses remove the bandages from his head and find no disease. Seattle Archbishop Alex J. Brunett, with Jake and his family by his side, announces at the annual meeting that the Vatican has begun to investigate the instantaneous cure. — 2011: Vatican announces Jake’s cure as authentic and the essential miracle required for Blessed Kateri’s canonization. — 2012: Conference meets in Albany, New York, in July and much of it focuses on stories and celebrations of soon-to-be St. Kateri. On Oct. 21, Pope Benedict XVI proclaims seven new saints, among them St. Kateri. He calls her the “protectress of Canada and the first Native American saint,” and he entrusts her to “the renewal of the faith in the First Nations and in all of North America.” The Finkbonners and Sister Mitchell take part in the Mass of canonization. — 2013: Conference national office relocates to Alexandria, Louisiana. — 2014: The conference’s annual meeting returns to its Fargo birthplace to mark its 75th year.